We rose early to begin our 7-hour drive to Berlin, but about 10 minutes into our drive we got a flat tire. This forced us to pull over during the morning rush and put on the spare. As luck would have it, as soon as Nolan got under the car to start working, it began to pour! Classic. Once we got the donut tire on the car, we knew we had to make alternative plans because there was no way this tire was taking us all the way to Berlin. We stole some Wi-Fi from a coffee shop, found a local Hertz branch and began the exchange process. Once we exchanged rental cars, we drove 10+ hours (with tons of traffic and accidents) to Berlin. Despite the beautiful cars the Germans make, we did not find them to be the best of drivers! When we finally arrived in Berlin, we realized we were missing a bag…come to find out, in the car exchange, one of the camera/electronic bags got left behind! Full disclosure: it was Nolan’s. We panicked, especially since at this point in the night every office in Europe was closed, so we fired off a few panic emails and tried to get some sleep. Luckily though, the next morning we received an email from Hertz Copenhagen that they had our bag and we entrusted the folks at LuggageFree.com (who were super helpful) to get the bag sent to a future hotel destination (Munich, Germany), where we would receive it a week later. It was a whirlwind of emotions, but luckily it ended positively! Once the bag situation was under control, we explored the city of Berlin, which was rich with history, including the Reichstag Building, Brandenburg Gate, Memorial to the Murdered Jews of Europe and the Berlin Wall Memorial. Graffiti was also abundant and is a huge part of the culture there. We also enjoyed a few of the local specialty coffee shops, including Ben Rahim and Five Elephant Kreuzberg, which both had excellent pour overs. After a few nights in Berlin we drove to Prague, which was a mostly flat drive with HUGE wind turbines everywhere. We arrived at our hotel in Prague in the early evening and went out for a traditional Czech meal in the middle of the Old Towne Square. We had an awesome dinner, which included weiner schnitzel, sausages, veal tartare, and of course Pilsner Urquell. We experienced the Prague Astronomical Clock, which is the world’s oldest operating medieval astronomical clock. It comes to life on the hour with the “Walk of the Apostles” show of figures and other moving sculptures. After we finished mass in Prague, we had some lunch and then drove a few hours into Poland. We stayed in the small town of Oswiecim at an amazing boutique hotel called the Hotel Gallenica and Spa. We also had an awesome dinner with traditional polish fare before crashing. The next morning, we woke up very early and went first thing to embark on a self-guided tour of the Auschwitz concentration camps. Words simply cannot describe the unforgettably moving experience we had visiting the Auschwitz-Birkenau Memorial and Museum. We only snapped a few pictures from outside the camp (for obvious reasons) but the experience itself will be one neither of us will ever forget. While we know this trip will be full of lots of beautiful places, we also had to remind ourselves that there are a few dark places that are part of our world’s history that are necessary to experience. This was certainly one of those places and helps to put everything into perspective. We made a brief stop in Krakow for lunch to regroup before driving south to Budapest. By far one of the best cities we have ever visited! Everyone was friendly, the food and coffee were great and the city had an energetic vibe to it that we really enjoyed. Budapest almost feels like Paris and our Airbnb was right in the city center and the building we stayed in was over 100 years old and used to be the home of the owner of the Hungarian National Museum (which was right across the street). The Hungarian chicken paprikash with spaetzle was delicious! We must learn how to make it when we get home! We also learned that Hungary has a very rich wine history, dating back to at least the Roman times, but many believe they may have been making wine even before then! The wine regions of Hungary actually sit on very similar latitudes to those in France and we actually drove through some of the vineyards on our way out. It was beautiful. While in Budapest, we got some good photos atop St. Stephen’s Basilica and the Citadella. We also had a beer at a very interesting ruin pub called Szimpla Kert. Ruin pubs are located in abandoned buildings of Budapest’s District VII neighborhood, near the Great Synagogue, which was once home to a flourishing Jewish community pre-WWII before tens of thousands of Jewish residents were deported. It’s amazing how many countries across Europe were affected by the atrocities of the Nazi occupation. We spent a total of three nights in Budapest and wish we had stayed longer. It was probably the biggest positive surprise of the trip so far. We had a blast walking around this stunning city and will absolutely have it on our list of places to go back to and spend more time! Highly recommend! We arrived in Vienna in the afternoon of April 19th and it was snowing! Let us rephrase: it was a blizzard. Obviously, this was extremely abnormal given the time of year, which we confirmed with our Airbnb host. This was certainly not the “spring in Europe” we had envisioned! For whatever reason, between the long drive and the poor weather we both hit a wall the first day we arrived. I think we went to bed around 8pm without seeing an inch of the city, but we needed a recharge. The next morning, we got up early and pretty much had the city to ourselves. We strolled the streets of Vienna all morning and early afternoon to quickly experience a bit of the city’s atmosphere and architecture. We enjoyed a lovely breakfast at a traditional Viennese café called Café Central, which initially opened in 1876 and was a regular meeting place for many historical people, including Freud and Trotsky. We walked through the old city center and were enamored by the amazing architecture and beauty of the city. We also visited Belvedere Palace, where the flowers had just bloomed. While it was a quick stop for us (1-night) we felt like we got a taste for the city and can see why it came highly recommended by so many people. I think we also started to realize we needed to get a little more strategic with our travel times and length of stays. Again, we are still learning! From Vienna, we drove east toward Munich, Germany. But, along the way we decided to stop for lunch in the quaint town of Passau, where Kirby’s great-grandmother grew up and eventually immigrated to the United States from. We loved this town! It was beautiful and situated right where the Danube meets the Inn and Ilz rivers. The town itself almost felt like it was stuck in time: old cobblestone streets, family businesses and beautiful town squares. We even talked to a store owner who knew of Kirby’s family. Crazy! We had an amazing lunch at a small family-owned and operated restaurant before ascending to the highest point across the river so we could get some aerial shots of the town. It was gorgeous to see the city below and the rolling farm hills off in the distance. We were so glad we made this stop and we know Anna Roth Kirby was smiling down somewhere! We arrived in Munich in the evening and went straight to our first beer hall. Nolan wanted the authentic experience and we sure got it! Long wooden tables, no English and seated in close quarters with complete strangers who gave us ugly looks and only wanted to drink their beers and eat their food without anybody bothering them. It was pretty cool! The next day we finally got some spring-like weather and discovered the open-air farmer’s market in the city center as well as the various landmarks such as the Marienplatz and the Englischer Gartens. We spent our second night at (surprise surprise) the Augustiner-Keller Beer Hall, where we befriended a few gents from Manchester, UK as well as three young locals. Due to the quick comradery we had a few more pints than we bargained for, but it was a great way to experience Munich and learn about the city and culture from some folks who lived there! The drive from Munich to Brussels was very picturesque, which was quite welcome due to our beer-hall induced headaches. We drove along the border of France, through Luxembourg and into Belgium. Rolling hills, wind mills and even a few hot air balloons graced the sunset as we drove into town. Had there been places to pull off we would have taken a ton of pictures! Simply stunning. After we got settled, we went out for a traditional Belgian dinner, including a Belgian waffle for dessert! We then visited Grand Place where Nolan got some incredible night shots. It was amazing to experience this old town square at night with the beautiful buildings lit up. One of our good family friends gave us a tour around the city the next day and shed some light on life in Brussels. It was a lot of fun to catch up and converse with some friends from home. We even went to one of the oldest beer halls in Belgium (as if we hadn’t had enough) for a pint as we walked the narrow city streets on a gorgeous Sunday afternoon. We also ended with a stroll through the Parc de Bruxelles to see the Royal Palace. Even though we used Brussels as a stopping point for 2 nights, it was still a beautiful city that we could see ourselves visiting again. We also know we skipped a few day trips (such as Bruges) that would have been worthwhile if we had planned a bit better. Next time for sure! While we had heard amazing things about Amsterdam, we couldn’t believe how magical this city was! 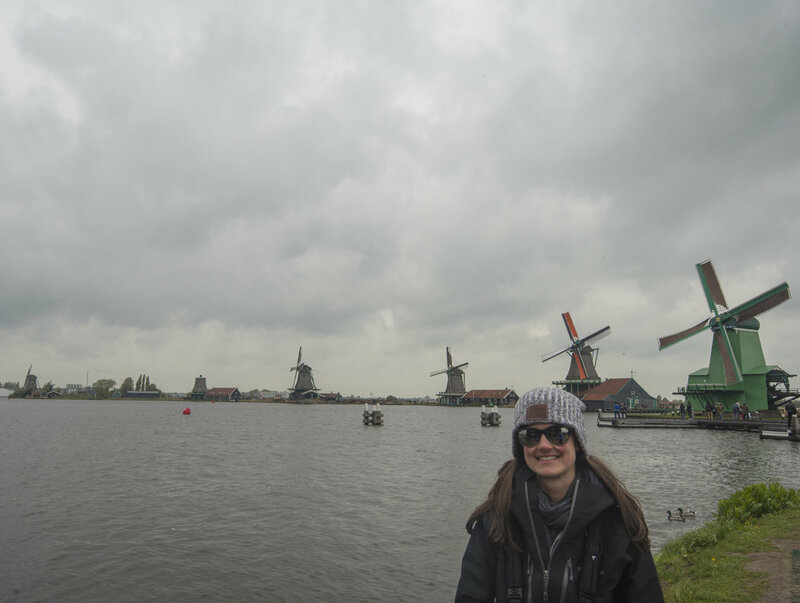 The canals, the homes, the culture…it was all just incredible. We decided to stay 3 nights here, but could have easily stayed much longer. We started our visit by going to see the incredible tulip gardens and farms at Keukenhof. The tulip season in Holland is from mid-March to mid-May so we could not have timed this better. Kirby probably could have stayed there all day and neither one of us had ever seen so many flowers in one place. It was remarkable. After walking through the gardens we stopped at a few farms and there were fields of tulips for miles. It was crazy. We also stopped on our way home to visit the famous windmills outside the city. On days two and three we walked the entire city of Amsterdam. We walked through centrum, the various canals, the red light district and stopped by the Rijksmuseum. While we heard the Anne Frank house was a MUST visit, the two of us were mighty sobered enough by our previous stops that we decided to skip it this trip. We also learned the hard way the difference between a Café and a Coffeeshop…look it up. On one particular day we even walked home through the evening commute where we could not believe all the cyclists coming home from work dressed better than most who frequent a board room! It was an incredible sight to see and it seemed most of the daily commuters had better bike handling skills than anyone we have ever seen cruising in the US (particularly NYC)! We also couldn’t believe the beautiful homes strewn along the canals and the beautiful houseboats that rested below the streets. This city is a must-go for anyone traveling to Europe and if you are into flowers, definitely try and visit in the spring! The unique charm and character that we felt in Amsterdam is definitely something we had never experienced before in a city. We traveled to Ireland & the UK next. Stay tuned this week for an update from that part of our trip!